The film opened with close-ups of an unidentified, bespectacled individual deleting files from his computer. Poisonous gas vials or capsules (with skull and cross-bones labels) were being applied to research test subjects in tubes - spiders. The man grabbed his ID label - he was identified as OSCORP INDUSTRIES staff member Richard Parker (Campbell Scott), a worker in the Genetics Laboratory of the Genomics Division of Oscorp. Suddenly, all of his account accesses were denied, cut off, or revoked, and an alarm sounded. He grabbed his leather briefcase and fled the building out into a rainy night. Later in his home's basement, he hurriedly recorded a webcam video message to try and explain himself: "People will say I'm a monster for what I've done, and maybe they're right." He rushed upstairs when interrupted by calls from his young son Peter (Max Charles). He entered his ransacked office where he found Peter standing by his desk. A mini-van sped away to Aunt May (Sally Field) and Uncle Ben's house. After a short discussion, Richard and his distraught wife Mary (Embeth Davidtz) left their son in the care of his relatives. A private jet took Richard and Mary to a "safe place" at Lake Geneva. Richard uploaded his project files (including his video) to 'Roosevelt' from his laptop, via a satellite uplink to a secure server, as he told her: "Our life as we know it is over. We're gonna spend every day from now on looking over our shoulders. Never feeling safe. We can't do that to him." According to Richard, they had done the right thing to find a secure place for Peter to stay. As Mary entered the restroom, the G-5 co-pilot (Bill Heck) emerged from the cockpit, but was viewed as suspicious when seen washing blood from his hands. The co-pilot - an assassin and hijacker - took a gun from a drawer and threatened Richard as the upload of files commenced. Mary burst out of the locked bathroom and as both Parkers struggled with the gunman, she was shot in the stomach. After helping her into a seat, he resumed the interrupted, partially-completed upload (63%) of files. The co-pilot revived and continued to beat at Richard. In the cockpit, the pilot's dead body slumped onto the controls and the jet went into a deep dive, as the two combatants continued to struggle with each other. After the co-pilot closed Richard's laptop cover and stopped the upload, and Richard noticed that Mary was dead in her seat, he grabbed the gun and shot out a window. The co-pilot was ripped out of the doomed plane to his death, enabling Richard to complete the file transfer process 100%. But the plane was nose-diving in a death spiral. The camera followed a Spider-Man logo, emblazoned on the back of the superhero's suit-costume, as he flew over the city, and used his web-slinging or shooting abilities to make his way from building to building. He overheard a news-helicopter radio report: "An Oscorp truck carrying plutonium has been hijacked. A police chase is in progress." Spider-Man/Peter Parker (Andrew Garfield) decided to join in and fight the crime, and he rapidly swung down in pursuit to join the chase. A huge tow truck that was pulling a stolen armored Oscorp van, driven by Russian-accented Aleksei Sytsevich (Paul Giamatti) (with a barbed-wire tattoo circling his bald head), crashed through a NYPD barricade. Two of his armed cohort assistants (Dusan Hyska and Andrei Runtso) jumped onto the van's thick roof and set explosives, to blow a circular opening. The van was carrying vials of dangerous, yellow Plutonium-238 radioactive chemicals - the highly-explosive target of the thieves. Meanwhile, on the sidewalk outside of the Oscorp Building in downtown Manhattan, nerdy employee Maxwell "Max" Dillon (Jamie Foxx) was carrying an armful of blueprint rolls. As he gathered them together after they fell from his grasp onto the street, Spidey was forced to save the inept worker from the truck that had barrelled through an intersection. Afterwards, he encouraged him: "You're my eyes and ears out here." The tow-truck and van came to an abrupt halt, causing dozens of police cars to crash into the rear of the vehicles and possibly endanger everyone with the dislodged, volatile yellow vials. The back doors of the van burst open, and Aleksei's two cohorts opened fire on the police. Spider-Man grabbed the two thieves and their weapons with his webs, leaving them dangling upside down. He then saved the P-238 containers by catching them in mid-air, in the midst of the chaotic truck pursuit. I know we all think that we're immortal. We're supposed to feel that way. We're graduating. But, like our brief four years in high school, what makes life valuable is that it doesn't last forever. What makes it precious is that it ends. And I know that now more than ever. And I say it, today of all days, to remind us that time is luck. So don't waste it living someone else's life. Make yours count for something. Fight for what matters to you. No matter what. Because even if we fall short, what better way is there to live? Intercutting of scenes occurred between the high-school graduation and the chase sequence in downtown Manhattan. Police cars were still in pursuit of the tow-truck and the attached van, and Spider-Man continued to save lives. He finally was able to apprehend the driver Sytsevich and constrained him in a web-straitjacket, and then grabbed the last of the vials before strolling away. Peter was able to quickly return to his HS graduation. [Note: An elderly man in the audience was portrayed by Spider-Man and comic-book creator Stan Lee, in a brief cameo, who remarked as he watched Spider-Man change his costume and rush to the stage to receive his diploma: "I think I know that guy."]. Peter gave a passionate kiss to Gwen on stage. His adopted mother, Aunt May, was very proud of him, but also was sad: "I wish your Uncle could have been here." Peter added: "Yeah, me too. And my folks." I promised him that I would keep away from you. And now I'm gonna come and eat dinner with your family. How can I do this? What does this make me?...It makes me not able to live with myself...Because what if something happens to you just like it happened to him because of me?...I cannot let that happen. Frustrated with him ("I can't live like this"), she decided to break up ("I break up with you"). In the next few days, repeated sightings and rescues of Spider-Man sparked debate on talk radio over the superhero's vigilantism in American crime fighting - there was concern about the ancillary damage of Spidey's interventions and cost to the taxpayers, and the belief that the police should be allowed to do their job. During a montage, some wondered whether there was one Spider-Man or many, and others speculated: "Who's behind that mask?" One of the callers to the talk show was Max who defended Spidey: "Spider-Man, to me, is being misunderstood. He's a very, very good person. He's protecting us. Not only that, but he saved my life one time. We sort of became best friends." However, newspaper headlines read: "SPIDER-MENACE?" and one disgruntled observer complained: "This Spider-Man... He's not the police, he's not a fireman. What gives him the right to get involved in other people's business?" In his upstairs bedroom in Aunt May's home, Peter spotted a leather briefcase with the initials R.P. - it spurred a flashback to some cheerful youthful family days when he was being playful with his father. Shortly later, Aunt May revealed that she was juggling her work schedule - she was training for a hospital position while working her regular job as a waitress for her boss Harvey. To help with the finances, free-lance photographer Peter claimed he had sold a few photos (of Spider-Man) to The Bugle and his boss Jameson. In Max Dillon's cluttered apartment, lights switched on to illuminate various news clippings of Spider-Man posted on the walls. While shaving, an obsessed Max spoke to a life-sized photo of his superhero, and seemed to be delusional about them being "best friends" during his fanciful conversation with his alternative persona: "That's why you're here. You remembered my birthday. All the crime-fighting you've been doing, and all of a sudden, you take time out to come visit little old me. Max. It's amazing to... but, of course you would. Why wouldn't you visit me? We're best friends." He further commended his hero Spider-Man for his incredible and kind feats, and proposed calling him "The Amazing Spider-Man." Max entered the towering Oscorp Industries building on the Avenue of the Americas, where a holographic female named K.A.R.I. (or Kari) (Sarah Gadon) announced: "Oscorp Industries is proud to announce the world's first electromagnetic power grid. By converting aging power stations into a field of hydroelectric towers, we are generating clean, green, sustainable energy to power Manhattan, the five boroughs and eventually the world for generations to come." He was reminded that he was late by his supervisor Alistair Smythe (B.J. Novak), who slightly humored his delusional employee (Max took credit for designing Oscorp's power grid). It must be cool, huh? To have the whole world look at you like that? You know, Spider-Man saved my life one time. Out of all the people in the whole city, he saved me. He said he needed me. Gwen shared her common interest and appreciation of Spider-Man - without saying much: "That must be a good feeling." I don't expect forgiveness from you, anymore. I don't believe in miracles. How could you possibly understand that your childhood had to be sacrificed for something greater? And not just for me. For you! Has your hand started to twitch yet? When you lay awake and you feel it coming, hiding under your skin, waiting to show itself. To show you who you really are. Retroviral hyperplasia. I never told you that it's genetic. Our disease, the Osborn curse. And it began at your age. Let me see it. Your hand. Give it to me. (Norman's claw-like hands grasped Harry's hands) The greatest inheritance I can give you isn't merely money. It's this. The sum total of all my work. Everything I did to stay alive. Maybe you can succeed where I failed. Not long after, a TV news report announced the passing of 63 year-old Norman Osborn, the legendary founder and CEO of Oscorp Industries, in the year 2014. Osborn was survived by his only son: Harry - "the sole heir of the Osborn corporate empire." According to the broadcast: "Osborn changed the medical profession's approach to human healing and affected the lives of millions." Mourning Oscorp employees were preparing to attend a memorial service for their founder. During her workday as an intern at Oscorp, Gwen received a phone call from Oxford Scholars Program with "exciting news." Electrical engineer Dillon was asked to stay behind (on his birthday) and examine a current flow problem in the lab, as everyone else left the Oscorp facility. He entered the bio-electrogenics power grid area with tanks of electric eels and other arrays of equipment to investigate the reported malfunction. After noticing a sparking disconnected cable above him, Max asked a co-worker named Gilbert to shut down power on Sector 32 while he made repairs, but was denied. When he attempted to reconnect the smoking electrical cable anyway, a power surge electrocuted him, the cable broke loose, and he toppled into a tank of genetically-modified eels below. In the water, as the eels attacked him and his entire body was electrified, the walls of the tank shattered and flooded the lab. During an Oscorp board meeting, the new 20 year-old CEO Harry (while twirling his father's cube-shaped device in his hand) was informed of the increased scrutiny on the $200 billion dollar company and its past scandals: "All the animal hybrid programs he was involved in were destroyed to restore investor confidence....We felt that plausible deniability was your best option." To aggravate his situation further with the other board members, young Harry appointed pretty young brunette Felicia Hardy (Felicity Jones), his father's assistant, as his own second-in-command. A butler notified Harry that Peter Parker had arrived in the outer foyer. They were reunited 8 years after being childhood friends, first awkwardly. Peter explained he was there to check on Harry and express his condolences after his dad's passing. Later the two spoke together in a local riverside park, and caught up on their past histories while roaming around the city. Peter admitted that he had an on and off relationship ("It's complicated") with a girl named Gwen Stacy, a work-study employee at Oscorp. While skipping stones on the water, Harry apologized for the long gap in their relationship: "When my father sent me away I tried to forget everything about this place. I guess that kind of included you." Peter added that they both lost their fathers/parents: "We both got dumped." All that Peter's father had left him was a briefcase. From a surveillance vehicle across the river, their conversations were being monitored. Harry mentioned that the city had been plagued by strange occurrences: "Giant lizards and spider guys." Peter corrected him: "Just one guy. Just one spider man. Or woman. We don't know for sure." Harry joked: "Whatever, dude. He wears spandex to rescue kittens from trees." Peter had to respond: "I kind of like to think he gives people hope....Maybe eventually everything's gonna be all right." Inside the surveillance vehicle, Oscorp VP Menken began a discussion of Max's Oscorp accident with his dark-haired associate, the Man in a Black Suit (Louis Cancelmi). The scheming Menken was worried about Harry's ascension to CEO, in the wake of the incident involving one of their little-known (or "invisible") employees: "Wall Street's nervous enough with that child, Harry, taking over. We've gotta find a way to get him out. In the meantime, if the press gets hold of this accident, our stock will crater. So make sure this Mr. Dillon stays invisible. This could prove useful for us in the future." In an Oscorp laboratory, Dillon's corpse was lying on a table surrounded by flickering and sparking electrical lights. Smoke rose from the cover over his body and then suddenly the glowing-blue corpse re-animated and rolled off the table. Now transformed or mutated into a living electric generator, he had the ability to control the movements and actions of electrical tools, including a hand saw, with electricity extending from his palm. To cover his glowing blue eyes, face, and body, he donned a hooded sweatshirt and pants, then staggered toward the exit. That evening in the city, Peter and Gwen attempted to reconcile or make up. He crossed a street filled with bustling traffic, seemingly unaware, undaunted or oblivious to the danger, as a love song played on the soundtrack (Hans Zimmer and the Magnificent Six, "Ground Rules"): "Some say love is a burning thing. That it makes a fiery ring. Oh, but I know love as a fading thing. Just as fickle as a feather in a stream. I saw love, it came to me, it put its face up to my face so I could see..." They spoke about keeping up a friendship that was "uncomplicated," and about various light-hearted "ground rules" going forward. Meanwhile, Max Dillon emerged onto a dark one-way street and immediately set off the horns and car alarms of parked vehicles. After touching a car's headlight, electricity surged into his hand and absorbed the energy. He looked off into the distance toward the brilliant bright lights of Times Square - his next destination. As Gwen and Peter shared ice cream while strolling along, he admitted that he had been following her once (or more) a day, to keep her safe and "because it's the closest I can get to still being with you." Gwen realized that he was still in love with her, but then informed him that she was might be moving to England. A phone call had told her that she was one of two finalists for a scholarship at Oxford University, in molecular medicine. The recipient would be announced after an oral exam-interview. Peter was stunned by the abrupt announcement, but before the two could really discuss it, Peter sensed something occurring in the direction of Times Square. He left his street clothes and backpack dangling on a tree - and disappeared as Spider-Man. In the midst of Times Square, Max was surrounded by massive electrical digital-billboard advertisements that looked like distorted surges of energy in his view. The power surges came from a central electrical source located underneath a sidewalk grating. Max ripped open the grate cover and gripped a major power cable-pipe with both hands, causing sparks as he absorbed its energy. When accosted by an armed police officer, Max halted a truck in his path with bolts of electro-magnetic energy from his extended arms. He then raised the vehicle and then dropped it on its roof. Encircled by police cars, Max begged: "It's not my fault." A cameraman filmed him - projecting his glowing blue image onto one of the billboards as Max reveled in his newfound stardom: "They see me. You see me." Max lifted gas canisters tossed at him, and caused a shock-wave sending officers and cars flying. Other officers fired their guns at Max, who deflected the bullets with electrical charges. Spider-Man arrived and was able to calm the dangerous situation. Max was pleased to see Spider-Man, his hero, and reminded him of how he had been saved earlier ("I walked into the street. The car almost hit me. You swooped me up. You saved me. You said you needed me"). Spider-Man remembered: "You're my eyes and ears." Max was overwhelmed by the changes in his body: "It's strange, the power I feel. I got so much... I got so much anger." While trying to talk Max down and urging the cops to not fire, a sniper took aim and shot. Feeling betrayed when attacked, Max swung around and knocked the sniper from his catwalk. Although Spider-Man had successfully defused Max's volatility a bit, Max felt betrayed when bystanders rallied behind Spider-Man and chanted at their idol: "Spidey, Spidey, Spidey," while labeling him a "stupid freak" and "electro dummy." Max thought to himself: "He lied to me. He shot at me," and told Spider-Man: "You set me up. You lied to me!" In retaliation, Max sent a surge of energy toward Spider-Man and other fleeing onlookers to electrocute them, but Spidey was able to protect them with his last remaining wrist web-shooter. Max fired gigantic bolts of energy at Spider-Man, causing damage to surrounding buildings and one of the billboard displays. Max grabbed two broken electrical cables and jacked the sparking ends into his own chest. The massive absorption of energy caused the lights of Times Square to black out, and a radiant blast of energy tore through the city street. He sent the other displays crashing down onto screaming crowds of people who were scurrying away. Then, Max levitated above the Square and directed bolts of energy from both hands at the people below. Spider-Man's only option was to direct the strong water spray of a fire hose at Max, to disrupt his electro-magnetic power, and to send him plummeting to the ground where he ended up convulsing. Now weakened, Max was apprehended and taken to Oscorp. "When life leaves you high and dry, I'll be at your door tonight. If you need help, if you need help. I'll shut down the city lights, I'll lie, cheat, I'll beg and bribe, to make you well, to make you well. When enemies are at your door, I'll carry you away from war If you need help, if you need help. Your hope dangling by a string, I'll share in your suffering to make you well, to make you well. Give me reasons to believe That you would do the same for me. And I would do it for you, for you. Baby, I'm not moving on, I love you long after you're gone. For you, for you...."
He came across a CNN article titled: "OSCORP SCIENTIST, RICHARD PARKER'S STORY AND WORK LEAVES MANY QUESTIONS UNANSWERED," printed it and posted it, along with a picture of his parents and many other news clippings, photos and maps on his bedroom wall. He connected all of the items with a web of red lines - to try to piece together the puzzling evidence and information. Next-generation military body armor. Features include enhanced mobility, battlefield injury repair, direct nervous system interface. So the common household spider, um, unlike human cells, theirs contain the power to self-heal from severe infection, tissue damage, etc. We've used a radioactive isotope with compatible human DNA. Throughout the night, Peter was in his garage watching a YouTube video about electricity and batteries delivered by Science Investigator Dr. Jallings (J.D. Walsh), while he was tinkering with ways to electro-proof his electronic web-shooters using larger and more powerful batteries. One by one, Peter's trials failed and the batteries exploded. The next morning, Peter awoke in his garage to the sound of his cell-phone's ringtone - a call from Harry asking to urgently see him, since Harry claimed he was dying and needed to be saved ("I think you can help save my life"). Richard: You're looking at the world's first human-spider hybrids. The hope is to extract the venom from their glands and turn that into a cure. An agent that heals diseased cells. Norman: And if I can be cured, imagine what this could do for other diseases like Alzheimer's, even cancer. Harry stopped the video and noted: "They never made it to human trials. It's 14 years of research, and nothing to show for it. Except maybe this." He threw down the current newspaper edition of The Daily Bugle - a full front-page picture of Spider-Man in action - with Peter's photo-credit. Harry was convinced that Spider-Man's blood could help save him: "Spider-Man...He was bitten by one of those things, and it worked. I don't know how and I don't know why, but he can do everything else a spider can, including self-heal. I need to find him. I need his blood...It'll save my life." Peter was unsure and cautioned about a blood transfusion: "It may not, Har. It may not be that simple. You saw what happened to Curt Connors, right?" Harry pressed further, demanding and pleading that Peter (who he assumed knew Spider-Man) could help locate Spider-Man's whereabouts, but Peter refused. After a tremulous second request, Peter acquiesed that he would try to establish contact: "I'm gonna try and find Spider-Man." There was an accident in the Genomics lab, and they're covering it up. And I found out. That guy from Times Square last night? I met him. He was an electrical engineer in the building. And he loved Spider-Man, by the way. He was, like, a fanatic... I was searching for him in the computer and all the files, he's erased. Completely erased. Peter explained why he was in the building - to visit with Harry, who was dying and wanted Spider-Man's blood: "And he thinks the only thing that's gonna save his life is my blood, is Spider-Man's blood. And as far as I know, if I give it to him, it could kill him." He was starting to mention that he didn't want her to go to England, and then kissed her. Peter caused a distraction with the security officers and the dark-haired man, to allow time for Gwen to escape in an elevator - although she happened to share the downward ride with Harry. He introduced himself as "an old friend of Peter's" - she admitted that their relationship was "complicated" and that they were currently broken-up. Everyone in this city is gonna know how it feels to live in my world. A world without power. A world without mercy. A world without Spider-Man. And everyone will be able to see me for who I truly am. Dillon christened himself with the name "Electro," when an ominous warning sounded that the "electrical restraint capacity" had been reached, and that a lockdown procedure needed to be initiated. A few days after the funeral, two government men came to see us. They said the genetics research that your father was doing with Norman Osborn was very valuable, and that people would pay a lot for it. And that's why he ran off with it. They said he was a traitor. I couldn't believe it, Peter. They told us he betrayed his best friend, all of us, for the money. Both of them admitted that they didn't believe the government's version of the story. Aunt May thought there was more to it: "Maybe everyone has a part of themselves they hide. Even from the people they love." As Spider-Man, Peter visited with an ailing Harry again at his home, but refused to offer his blood a second time: "I can't give you my blood....It's too dangerous. If our blood is incompatible, you could die." Desperate for his blood, Harry offered Spider-Man money and material things, and then used another tactic - guilt: "I thought you were supposed to save people." Spider-Man suggested more time "to figure out something else." When Harry became incensed, Spider-Man apologized and flew away through an open window. Spider-Man overheard Harry as he screamed out: "You're a fraud, Spider-Man!" Frustrated, Peter interrupted Gwen on her way to her finalist interview for an Oxford scholarship, and explained how messed up everything was for him: "My Dad, my Mom. Everything I thought about them? Lies. Ha! Lies. Lies, lies, lies. Nothing makes any sense anymore. I gotta figure out what I'm gonna do with Harry. Of course I wanna save him. You know? I wanna save him because he's my best pal. And what if my blood works? But what if it doesn't?" He calmed down enough to wish Gwen luck. Back in his bedroom, Peter ripped apart his webbed montage of photos on his wall. When he hurled his father's calculator at the wall, it broke apart and spilled out lots of gold-colored subway tokens. He recalled what Aunt May had told him earlier: "He took the D train every morning at 7 to work. Came home at 6:00 every evening." He tried another Google search on: "Roosevelt + Subway + D-Train" and opened a link to a site titled "Abandoned Stations." He learned about the "Roosevelt - Spur" on Track 61 - "a secret subterranean extension of New York's D Line train under Pershing Square built to transport President Franklin Roosevelt away from the public eye, to keep his polio hidden from the American people." "Roosevelt" was the destination of his father's video and data files in the film's opening scene. In Harry's penthouse office as he drank heavily, he told his assistant Felicia that his fate was sealed unless the super-spiders that had been destroyed were brought back to life. She informed him that before the spiders were killed ("to restore investor confidence" after numerous lawsuits), their venom was secretly extracted: "That way, they could comply with the lawsuits, but still keep the data in case it ever became useful." Harry searched the off-books Special Projects files in the Ravencroft Archives - they were a collection of videos about the 'Max Dillon Experiment.' He watched the surveillance footage of the initial accident that turned employee Max Dillon into Electro. And in File 71, he also viewed the video of Max's containment in a water tank and his threat to "kill the light." And then AI Kari's voice announced that Harry's user access had been revoked, and he had been detected. Apparently, Menken had used Harry's security clearance to initiate the Special Projects division at Ravencroft Institute. When Harry confronted Menken (and other board members), he learned that he had been implicated for the Max Dillon incident and demoted as CEO, to take away his control of Oscorp: "An employee is killed and in your first action as CEO, you cover it up...Now, in light of your deceptive criminal actions, you've been...fired." And then Menken meanly added: "You're going to die a horrible death, like your father." My name is Richard Parker. Whatever lies will be told about me, I would like the world to know the truth. Oscorp was already a leader in genetic research when Norman Osborn made a deal with a foreign military organization to continue funding my research. And I discovered what they were going to use it for. Weapons. Biological weapons, of course. So I refused. And now, to eliminate me from the picture, Norman Osborn has falsified evidence against me in order to take control of my work. But it doesn't matter because there's something else that Norman doesn't know. The human DNA that I implanted in the spiders was my own. Which means that without me, without my bloodline, Oscorp can never replicate or continue my experiments. I have destroyed as much as possible from the archives. But I didn't have time to kill all of the spiders. In the final moments of the video, Peter listened as his father explained his reason for disappearing, and for leaving his son (for safety's sake) with relatives: "As a father, it means I may not see my boy again. And nothing is as important to me as my son, Peter." The statement brought tears to Peter's eyes as he was overcome with emotion. Meanwhile at Ravencroft, Harry made his way into the facility by tasering two guards and stealing their access badges. He made his way to the docking chamber where Electro was held - and incubated with heavy doses of drugs. Harry also pulled a fire alarm in the Iso Unit as a distraction. He turned off Electro's sedation, then made a bargain to release Electro if he would agree to help him get back into Oscorp. Harry asserted that they had both been betrayed by the corporation, and that their real mutual target was Spider-Man: "Once you shut down the grid, Spider-Man will come to you, and I want you to make him bleed." Harry's appeal to Max's needy cravings for attention worked, when he begged: "I need you. You are my only chance that I have at surviving....I know what it's like to be thrown away!" Although Harry was seized by security guards, Electro's body disintegrated and flowed into the conduits of the surrounding equipment - sparks of electricity electrocuted Kafka and the other guards. Afterwards, Electro's body rematerialized as a mass of electrical energy floating above the floor. Now that they were allies, Electro and Harry plotted to escape together. Electro vengefully zapped the injured and fleeing Kafka with a lightning bolt in his back, and placed the screaming doctor into his own containment apparatus that dipped him into the pool of water. Electro vowed his next step to Harry: "Let's go catch a spider." As Peter existed the subway tunnel, he received a voice-mail message from an excited Gwen about her acceptance into the Oxford program. She was on her way to the airport, and leaving earlier than originally expected, possibly to avoid a difficult face-to-face farewell. However, she admitted that she was leaving because of her love for him. At Oscorp in downtown Manhattan, the Man in the Black Suit and a guard monitored surveillance cameras that had been disrupted by Electro. When the dark-haired man entered the penthouse suite to warn Menken of the danger, he was killed by a blast of Electro's electricity through his chest. Electro (wearing a rubber suit to contain his powerful electrical charges) and Harry entered and threatened: "How the tables have turned!" Menken was unperturbed: "You recalcitrant, unworthy, defective, urchin freaks." However, after being zapped unconscious and then revived, Menken (at gunpoint) was forced to grant Harry access to the Special Projects Division. Harry allowed Electro to leave and reclaim his stolen power-grid design and take down the city's power grid: "The grid is all yours." In the darkened circular chamber of the Special Projects Division that held containment units, Harry demanded access to the stored spider venom (from the now-destroyed spiders), deposited in vials of green liquid, to be available and cure him of his genetic disability. A screen displayed their scientific name: "Araneus Oscorpeus." Harry forced Menken to load the green venom from one of the vials into a pneumatic syringe, although Menken warned: "It won't work." After the syringe was withdrawn, Harry began to show signs of an accelerating illness when he painfully transformed and collapsed with darkening flesh and veins, and his fingers sprouted long sharp nails. As Menken fled to an elevator, Harry spotted a nearby chamber holding a specially-armored, high-tech containment suit made by his father, with mechanical wings and tentacles. As he donned the suit, built-in emergency healing protocols commenced and his ravaged, damaged body began to repair itself. On the way to the airport, Gwen became stuck in heavy traffic. Her taxi driver looked out and exclaimed: "It's Spider-Man!" Gwen smiled, exited the unmoving cab, crossed to a railing and looked out with others at a giant love note spanning the suspension cables of the nearby Brooklyn Bridge: "I LOVE YOU." Spider-Man swept in, scooped her off the ground, and the two flew to the top of the structure. In a romantic moment backed by the setting sun, he affirmed his love for her, and suggested they go to England together: "England. Both of us." They shared a passionate embrace. The electrical grid in the city began to power-down and expand as a result of Electro's interference, who had materialized at OscorPower's waterfront power plant. Pulses of electricity were seen throughout the darkening city. Air traffic control operations and air-flights were seriously affected by the disruptions, as well as all ground transportation and hospitals. Gwen noted a possible back-up option to the black-out: "There's an emergency reset at the power plant. If he cuts the transmission lines, they're never gonna get this back up." She also suggested that Spider-Man magnetize his web-shooters to prevent them from being damaged again by Electro. They electro-proofed Spider-Man's web-shooters using jumper cables, a policeman's squad car, and copper wire. Afterwards, he insisted that Gwen not join him to stop Electro, and web-attached her to the police squad car hood, although she protested that she knew the grid specs and had the knowledge to "reset the system." I designed this power grid. Now I'm gonna take back what is rightfully mine. I will control everything. And I will be like a god to them. Spider-Man countered with a spray of water from a large conduit, while Electro continued to try and electrocute him and ensnare him with electrical bolts. The two battled back and forth between the grid towers, with neither of them gaining the upper hand, until Gwen (after releasing herself from the car hood) arrived and slammed into Electro with the police squad car. Gwen and Spider-Man conspired together - she would reset the system, while he distracted Electro. Ultimately, the two were able to defeat Electro by overloading (or over-charging) his supply of electricity with a magnified surge of energy until he completely exploded, while they also restored the city's power (and diverted the planes from a collision). However, another threat arrived at the restored power plant - a cackling and maniacal Harry appeared as the Green Goblin riding on his Goblin glider. He was fully equipped with Norman's armor and weaponry. Noticing Gwen and Spider-Man together, the Goblin quickly figured out that Spider-Man was the secret identity of Peter Parker, his friend who had betrayed him. To seek revenge for being refused the blood transfusion, the Goblin snatched and kidnapped Gwen, and hovered above the top of a nearby clock tower's dome. He then dropped Gwen from the glider, and although Spider-Man caught her, the two crashed through the dome's window as he cradled her fall. Soon after, the Goblin (on his glider) and Spider-Man (using his webbing) engaged in a climactic fight inside the tower, while Gwen attempted to escape from falling debris by negotiating between giant clock gears. In the end, the two fought on the top of a clock wheel-gear, with Gwen suspended and held below by one of Spidey's life-line webs. As the clock mechanism moved, the web holding Gwen was cut between the teeth of two adjoining gears. When the web-line snapped, Gwen plummeted downward in a dizzying free-fall. Although Spidey managed to dive after her and catch her with a strand of webbing, the sudden impact of the rescue broke her neck, and she died instantly. Spider-Man removed his mask, took her lifeless body into his cradling arms, and began to mourn as he pleaded: "Stay with me, stay with me....I can't do this without you." A grave-side funeral was held for Gwen, attended by uniformed police officers, Gwen's devastated mother Mrs. Stacy (Kari Coleman), and a heartbroken Peter with Aunt May. After the service, a grief-stricken Peter remained steadfastly at Gwen's gravesite - watching over her for several months - presumably, and suspending his duties as Spider-Man. You've made progress. I've identified several worthy candidates. Now that Spider-Man's gone, this city will never be the same...Speaking of progress, you're looking better. Harry had a plan, but insisted that an assembled team be kept small: "I wanna keep it small. Everything you need is already at Oscorp." Friers identified the first designated test subject of "several worthy candidates" as Russian gangster "Aleksei Sytsevich. Currently serving a life sentence." Sytsevich had been broken out of a classified penitentiary (the Vault), and later within the Oscorp Tower in the city in the SPECIAL PROJECTS division, Friers walked down a corridor lined with Oscorp-developed suits for Doctor Octopus, the Vulture, and a specialized armored suit for The Rhino. It's easy to feel hopeful on a beautiful day like today. But there will be dark days ahead of us too. There will be days where you feel all alone. And that's when hope is needed most. No matter how buried it gets, or how lost you feel, you must promise me that you will hold on to hope. Keep it alive. We have to be greater than what we suffer. My wish for you is to become hope. People need that. And even if we fail, what better way is there to live? As we look around here today at all of the people who helped make us who we are, I know it feels like we're saying goodbye. But we will carry a piece of each other into everything that we do next, to remind us of who we are, and of who we're meant to be. It reminded him that he must maintain a sense of hope - he gazed at his Spider-Man mask and outfit in the closet. On mid-town's city streets, a new villain nick-named The Rhino (Paul Giamatti), wearing Oscorp's giant weaponized, mechanized and armored suit, was causing chaos after robbing a bank, and invincible in the midst of heavy police gunfire. A young civilian youth (wearing a Spider-Man costume), Jorge (Jorge Vega) ran from his mother in the crowd to defiantly stand face-to-face against the Rhino. Peter was inspired to return as Spider-Man - he swooped into the scene and congratulated his young admirer for being so brave, before the boy was returned to his grateful mother. 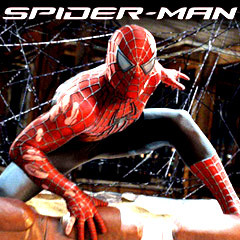 This was the fifth Columbia Pictures' theatrical Spider-Man film based on the superhero, after director Sam Raimi's original trilogy (concluding in 2007). It was released as a big-budget summer blockbuster sequel in 2014. It was the sequel to director Marc Webb's own hit in 2012. It was regarded as the final film in The Amazing Spider-Man series. The studio announced more installments to come in the superhero saga, as stand-alone films, and others in the Marvel's Cinematic Universe franchise. The superhero film again starred Andrew Garfield reprising his role as Peter Parker/Spider-Man, opposite love interest Gwen Stacy (Emma Stone). Jamie Foxx was featured as the meek Oscorp employee Max Dillon/villainous Electro, while Dane DeHaan was wealthy heir and scion Harry Osborn (Peter Parker's boyhood friend) - the Green Goblin, and Paul Giamatti was an Eastern bloc Russian criminal known as Aleksei Sytsevich, later personifying The Rhino. With a production budget of $?? million, and box-office gross receipts of $202.9 million (domestic) and $709 million (worldwide). Its box-office totals were lower than its predecessor, and far below the revenues in the original trilogy.